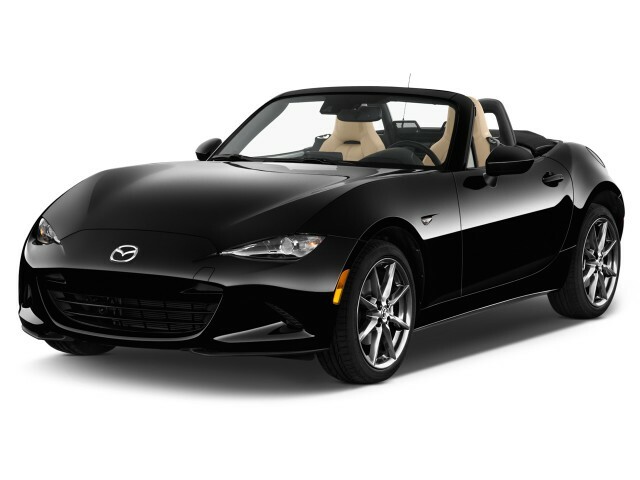 The RF model is simply beautiful, but decide if the looks and the bad weather security of the hardtop are enough to win you over, as it comes with a price premium. The 2017 Mazda MX-5 Miata offers back-to-basics sports car fun in the classic roadster or the new RF body styles. For the Mazda MX-5 Miata, the philosophy is, and always has been, back to basics. Now in its fourth generation, that holds more than ever, as Mazda has strived to keep weight down and the fun factor high. 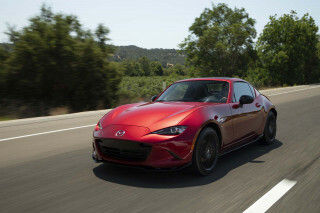 The Miata enters the second year since its redesign by adding the RF body style. RF stands for "retractable fastback," and it comes with a retractable hardtop that gives it the look of a coupe with the top up and a targa with the top down. The RF joins the standard roadster, but it has a premium price and is only offered in the higher line Club and Grand Touring models, leaving the base Sport model to the roadster. The look is low and sleek, with gracious curves and fine detailing inside and out. Weighing in at roughly 2,300-2,400 pounds, the Miata delivers plenty of smiles per mile. The engine is a pedestrian 2.0-liter 4-cylinder making 155 horsepower, but it can launch this car from 0-60 mph in about six seconds. A 6-speed manual transmission offers the most feel and the most fun, but the 6-speed automatic works well, too, especially in its Sport mode. Dynamically, the Miata is among the best cars on the market, and it proves that a sports car doesn’t need to ride rough or remain flat through corners to be fun. The Miata leans in turns, then takes a set and carves corners predictably. The ride is firm but almost as forgiving as a family sedan. The interior has just enough space for two and there is some room for their small items and a couple of overnight bags. The ergonomics of the cockpit are exemplary, the cabin is quieter than it was in the past, and the RF model shuts out noise even better with the top up. Despite the back to basics approach, the Miata offers some nods to modernity. An infotainment system is standard on all but the base model, and it comes with satellite radio, access to apps, and a text messaging function. The Grand Touring model offers such niceties as heated leather seats, automatic climate control, and a universal garage door opener. The Club model is even sportier; when ordered with the manual transmission, it comes with Bilstein shocks, a shock tower brace, and a limited-slip differential. Buyers can also get BBS wheels and Brembo brakes. The Miata also features some modern active safety features, including blind-spot monitors with rear cross traffic alerts, lane departure warnings, automatic high beams, and adaptive headlights that point into turns. 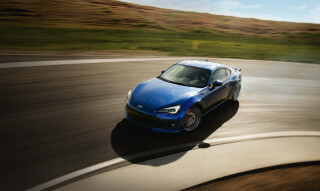 Fuel economy is tops among sports cars, with the automatic transmission delivering 26 mpg city, 35 highway, 29 combined. The Mazda MX-5 Miata offers a pert sports car profile, with a sleek, low-to-the-ground stance that is even better looking on the coupe-like RF body style. The 2017 Mazda MX-5 Miata features the long-hood, short-deck proportions of a classic front-engine, rear-wheel-drive sports car and its bodywork is sculpted and detailed. 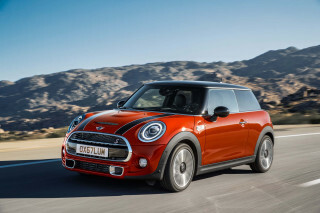 The look is expressed through the low-set yet blunt grille, the finely detailed headlamps, the arc of its fender lines, and the Coke-bottle shape along the flanks. The hood is curved, the tail tapers, and the body panels make the car look low and sleek. 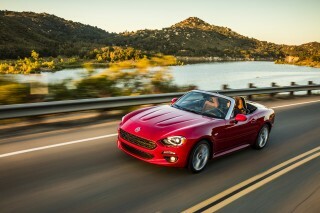 The RF is even more beautiful, with a classic coupe look with the retractable hardtop up. That top takes 13 seconds to open or close, and the look when down is more targa than convertible. That’s because the piece that forms the rear pillars and a crossbar between them remains in place while the roof folds out of the way. With the top down, the single, flowing line that defines the top of the car is interrupted, giving the car an awkward look from some angles. The interior doesn’t stand out like the exterior does. While mostly well-coordinated, the infotainment screen perches atop the dash instead of being integrated into the design. Some may also find the tech this screen represents to be anathema to the car’s simple, driving-focused ethos. Mazda works well with color, though, bringing in the exterior color on the tops of the doors and providing a two-tone look for some interiors. The 2017 Mazda MX-5 Miata’s light weight and small size give it smile-inducing handling and frisky acceleration despite modest power. From behind the wheel, the Miata feels positively perky. The 2.0-liter 4-cylinder engine produces only 155 horsepower, but with the manual transmission it pushes this tiny roadster to a 0-60 mph time of about six seconds. To tap into the power, you have to rev it up to and past 3,000 rpm. Keep going past the 4,800-rpm torque peak and the Miata responds like a much more powerful car. It’s easy, too, because the engine revs willingly. Shifting the manual gearbox is a pleasure. The gearshift snicks smoothly between gears, and the light, smooth and progressive clutch feel makes this car easy to drive hard or in city traffic. Mazda also offers a 6-speed automatic that does a good job of keeping the engine in its effective rev range when you choose the Sport mode. While the automatic is easier to drive every day, you lose the feel and control over the power that you get with the manual. The electric-assist power steering is quick and direct, though a bit light. The double wishbone front suspension and multi-link rear setup leans into corners more than you’d expect for a sports car. However, it then takes a set and carves through turns with precision, and that lean provides feedback about when the tires are about to lose grip. We detect no difference in handling between the roadster and the RF. Find a twisty canyon road and you can push the Miata hard without dynamic surprises. While it’s easy to drive hard, you don’t have to break the speed limit to have fun. The low driving position, and its relation to the car’s roll center, create a natural and informative driving experience that is sure to put a smile on your face. Want a bit more performance? Get a manual-transmission Club model, which comes with stiffer Bilstein shocks, a front strut brace, and a limited-slip differential. The Club offers sharper handling with slightly less body roll. If can be felt most in the fraction of a second just after you turn into a corner; the Club exhibits little if any weight transfer due to the front suspension loading up before the rear. The trade-off is some ride comfort. That’s okay because the Miata rides quite well, a benefit of the light weight and generally soft suspension tuning. 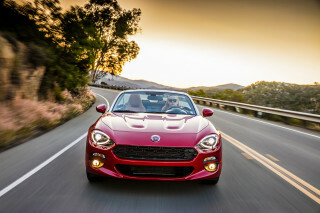 The Miata can filter out minor potholes and the jiggle caused by broken pavement, but sharper bumps and ruts can disrupt passenger comfort, especially in the Club model. The 2017 MX-5 Miata can only fit two but it has decent space for its size. The MX-5 Miata is a small two-seater, but Mazda engineers have squeezed as much space as they could out of the car. That gives it a bit more head room and leg room than previous Miatas. The Miata nails the ergonomics of how the driver sits in relation to the steering wheel, pedals, and most controls. Yet some of the design is a bit off the mark. The cupholders are removable; one requires an awkward reach back and the other gets in the way of the passenger’s knee. The infotainment system’s rotary dial is placed low and behind the shifter, where some with longer limbs will have to bend their wrists and elbows to reach it. While we like the simple menu structure, this system complicates programming radio stations and we can’t find a screen that lets you switch easily between radio stations. The seats feature a design that uses suspended fabric instead of springs and foam. It’s comfortable, but not as supportive as the best sport seats on the market. Still, these seats have good bolstering to support torsos during aggressive driving. While the trunk has a very small 4.59 cubic feet of cargo space, that does leave enough room for a couple of carry-ons or perhaps three filled backpacks. Mazda also provides a glove box and a small hinged storage compartment between the seats. While the Miata isn’t a quiet car, this generation is quieter than the previous one and the RF’s retractable hardtop makes it even more so. It is possible to carry on a conversation at speeds up to about 70 mph. That’s because Mazda paid attention to aerodynamics and wind turbulence, and also added an extra layer to the padded headliner in Grand Touring models. The RF not only shuts out more noise, but also provides a higher level of security versus hooligans who might want to cut the soft top. The Mazda MX-5 Miata hasn’t been crash tested and it doesn’t offer some key safety features but it’s nimbleness should help it avoid some collisions. The 2017 Mazda MX-5 Miata comes standard with dual front airbags, side airbags, and stout side-impact door beams. Club models add blind-spot monitors with rear cross-traffic alerts, and the Grand Touring models also have lane-departure warnings, automatic high beams, and adaptive headlights that point into turns. Two notable safety features are not available: a rearview camera and forward-collision warnings with automatic emergency braking. The lack of a rearview camera is an oversight because the view to the rear with the top up is rather obstructed. The 2017 Mazda MX-5 Miata may take a back-to-basics approach, but it also offers a solid feature set with some high-tech options. Mazda adds the RF body style to the MX-5 Miata lineup for 2017, but it is not offered is as many trim levels as the standard roadster. The roadster comes in Sport, sportier Club, and more luxurious Grand Touring models, while the RF comes only as the Club or Grand Touring. 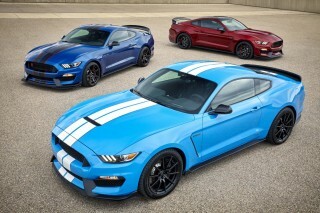 These choices let buyers pick what kind of sports car they want. The base model may lack some equipment, but it is value priced. 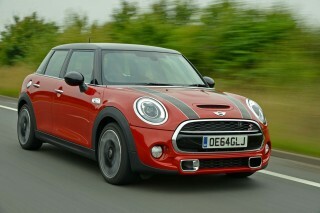 Other models have solid feature sets and offer buyers a choice of an even sportier MX-5 or one with more luxuries. Mazda charges a premium of roughly $2,500 and $2,700 for the RF, depending on model, and the lack of a base version makes it at least a $6,600 investment over a Sport model. The equipment is the same for both body styles, but the RF also gets the retractable hardtop that opens or closes in 13 seconds. The instrument cluster has a 4.6-inch display that shows top up or down status, as well as trip computer and compass information. 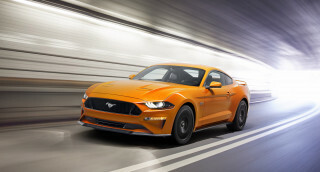 Standard equipment on the base Sport model includes cloth seats, air conditioning, a 6-speaker audio system with USB and auxiliary input ports, power windows, keyless ignition, a wind blocker, LED headlights and taillights, and 16-inch alloy wheels. 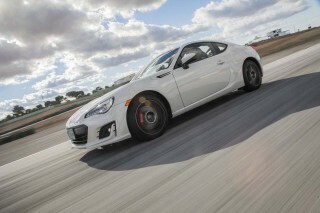 The Club model gets sportier looks, and, when ordered with the manual transmission, performance upgrades. 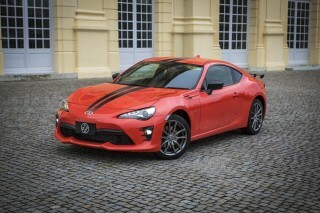 It comes standard with red stitching for trim and upholstery, satellite radio, a more aggressive front air dam and rear lip spoiler, piano-black side mirrors and seat back bars, and 17-inch gunmetal alloy wheels. Manual-transmission models also feature Bilstein shocks, a shock tower brace, and a limited-slip differential. Grand Touring models add more tech features and creature comforts, including heated leather seats, automatic climate control, Bose audio with a subwoofer, a universal garage-door opener, and 17-inch bright alloy wheels. Starting at the Club level, the MX-5 gets the Mazda Connect system. It runs through a 7.0-inch touchscreen that rises from the dash and a rotary controller on the center console. The screen’s touch capability only works when the car is stationary, leaving the rotary controller as the only means of control. The system also comes with HD Radio, an additional USB port, and voice commands, and through it you can access Aha, Pandora, and Stitcher internet radio, as well as text-messaging functionality. Mazda doesn’t offer many options aside from some appearance extras, some cargo solutions, and a few standalone upgrades. However, many Club buyers will want the Brembo/BBS package that brings upgraded Brembo brakes, BBS alloy wheels, keyless access and ignition, and an aero kit with side sill extensions and a rear bumper skirt. The 2017 Mazda MX-5 Miata is rated as one of market’s most fuel-efficient sports cars, and it delivers on that promise in real-world driving. The MX-5 Miata’s light weight not only improves acceleration and handling, it is also a boon to fuel economy.The 2.0-liter 4-cylinder engine also employs some fuel saving features, including all-aluminum engine construction, direct injection, and a high 13:1 compression ratio. Both the standard roadster and the somewhat heavier RF body style get the same fuel economy ratings. With the 6-speed manual transmission, the Miata is EPA rated at 26 mpg city, 33 highway, 29 combined, and models with the 6-speed automatic are slightly more efficient on the highway with ratings of 26/35/29 mpg. Those ratings put the MX-5 Miata among the most fuel-efficient normal-production sports car sin North America and earn it a 7 for fuel economy in our rating system. (Read more about how we rate cars.) Be aware, however, that the Miata is tuned to run on premium gasoline. In some exuberant real-world driving conditions, including on mountain roads, we have averaged between 27 and 31 mpg in several different cars. We got 31 mpg in the RF over a week that included a lot of highway driving.